Welcome to The Turquoise Table Podcast with Kristin Schell. Kristin’s guest in our debut episode is Thomas Farley, better known as Mister Manners. Thomas is an etiquette expert, speaker, and author who inspires audiences across America. He’s perhaps best known as the beloved guest in his role as Mister Manners on NBC The Today Show. Kristin and Thomas talk about what it means to be a good neighbor and Thomas gives tips on simple ways to get around barriers that keep us from knowing the people who live near us whether home is the upper West Side of NYC or suburban America. 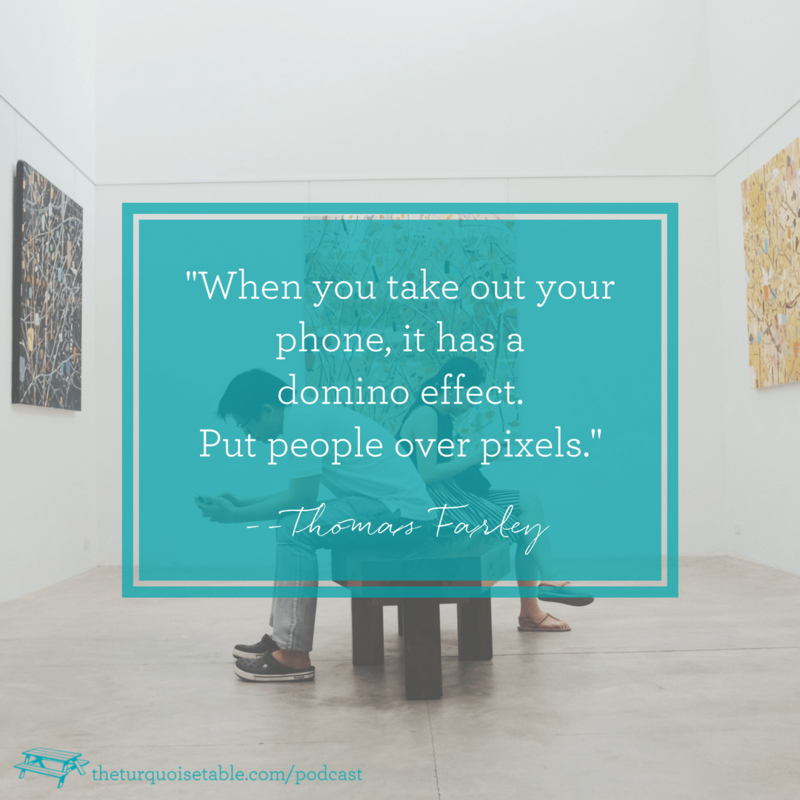 Emphasizing that face-to-face communication is always to be prized over digital connection, Thomas encourages us all to put “people over pixels,” and that life is much sweeter when we are in community with each other. In Kristin’s Kitchen segment this week, sponsored by Shipt, Kristin shares her grandmother’s delicious and easy chocolate sheet cake recipe. While she whips up the decadent cake, Kristin invites you to think about the rhythm of your neighborhood and shares a story from a Turquoise Table in Tulsa, Oklahoma. Read more below. Show opener: Desperate for a way to slow down and connect, Kristin Schell put an ordinary picnic table in her front yard, painted it turquoise. That first turquoise table became a meeting place for friends and neighbors, a place to connect and a symbol of hospitality. Now, Kristin invites you and her special guest to join her here at The Turquoise Table podcast. Welcome. Kristin: Welcome to The Turquoise Table podcast. I’m your host, Kristin Schell and I’m thrilled that you are at the table today. Our guest, to kick off this podcast, could not be more perfect. He is just the perfect personality to talk about being a good neighbor and living in community with one another. 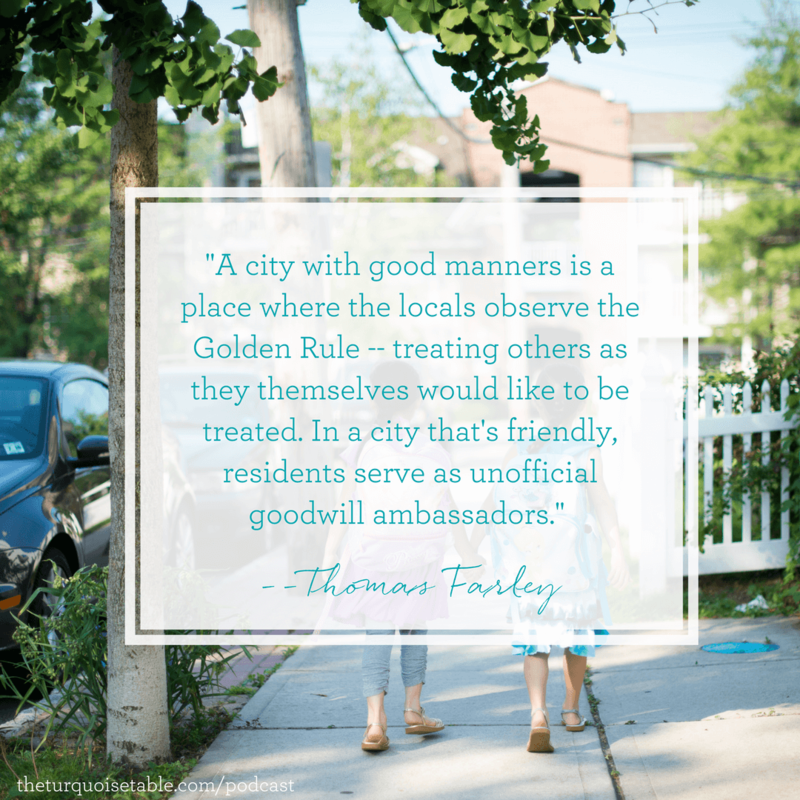 Thomas P. Farley is better known as Mister Manners. He is an etiquette expert, a speaker and an author. You may know him, as I did, from NBC’s Today Show. He is a regular and a popular guest on the Today Show where he speaks on matters of modern day etiquette. He travels all over the country and works with clients, big clients like The United States Department of Commerce and JP Morgan Chase and Walt Disney and SAWater. He works with big corporations and companies to help re-teach etiquette and why manners matter which, in this day and age, may seem like we don’t need it but as Thomas and I get into our conversation, you will find out, it is an incredible place to start. Studies, he is an author of his book called Modern Manners: The Thinking Person’s Guide to Social Graces. He is witty and charming and smart and you’re going to love him. You are absolutely in for a treat, I am so delighted to have Thomas around the table today and we’re going to dive in. We are going to talk about what it means to be better hosts, good guests, better friends and better neighbors. Without further ado, welcome to the table Mister Manners, Thomas Farley. Thomas, welcome to the show. It is such an honor to have you here. Thomas: Kristin, thank you so much. Hearing your voice is just reminding me of our time together in Austin doing our Today Show segments and I’m thrilled for your podcast. I can’t wait to see where it goes and I’m honored that you’re having me on as a guest. Thank you so much. Kristin: Well, thank you. For our listeners, yes, we did. We had the incredible opportunity, last year you were a guest at The Turquoise Table when you came down to film the segment for the TODAY Show which hello, was not my normal. It’s very much your normal to be on the Today Show but you were so full of grace and even though you were the guest at my table, I felt like you were just this incredible host. Thank you for that, thank you. Thomas: My pleasure. It was such a treat and I can’t tell you the excitement we had as we rounded the corners in your neighborhood and saw those turquoise tables out on your neighbor’s yards and then, of course, coming to the nexus of it all, at your home and spending that wonderful morning out there. Then the afternoon at the marketplace was terrific as well. Kristin: Yes. Well, I love it and I could not think of anybody better to help kick off this podcast series with us. Thank you because one of the things that I love and it’s straight out front in your bio, you have declared, really, an incredible mantra. In your bio, you say putting people over pixels and I love that. It’s so important. Will you tell me a little bit about what it means to put people over pixels and how you came up with that? Thomas: Sure. Well, I think it’s something that with each passing year, we find that our brain chemistry has been changing. I mean, literally changing, and we are social media addicted, we are e-mail addicted. With the advent of the smartphone and with further technologies that seemed to come on a monthly or weekly basis, we are just further and further engaged with our devices. There’s still only 24 hours in a day, so the number of hours you’re spending on social media or the numbers of hours you’re checking to see how many likes your latest Instagram post may have gotten, that’s time that you’re not giving to the people around you. Thomas: I want to make sure that I make it very clear, I’m not against tech. I love social media, I think it’s a wonderful tool. Obviously podcasting, here you go. You’re able to reach people you could not otherwise and I think we need to celebrate the technology. The technology itself is neutral, it’s how do we choose to use it and I think for many of us, it’s so easy. We grow accustomed to taking the less interesting, the less fun but perhaps the easier route which is going to a cocktail party and standing off to the side with your phone and not choosing the time to engage with the people around you. I think that’s really a lost opportunity. I think time and place for the technology but if you’ve got a live human being standing in front of you, please don’t say, “I’m listening, go ahead,” while you stare down at your screen. I think we’ve all been there, no matter how dynamic we might think we are, so I strive not to do that with anybody I meet. The phone is put away if I’m having dinner with friends, it’s not sitting on a table, face down, it’s not sitting face up, it’s away in my bag so I’m not tempted. There, I think especially at the table, you think of how much time and energy goes into getting a group of friends together, aligning schedules, aligning the stars to make sure you can all be there at the same time. Then, you don’t want to be the odd man out, sitting at the table starting into space, at the bread basket while everybody else is on their phones, so out comes your phone too. I think it’s really unfortunate; so if a person is in your midst, that person gets the priority, not the pixels. Kristin: I love that, I love that, I love that. That’s really where my story of The Turquoise Table started. I was more concerned with my kids because we live in this digital era and as you’ve learned when you were here and knew about our family, we are raising, what’s called, digital natives. I was even more concerned that they wouldn’t even know how to have a conversation. I know that seems drastic but it’s not. When we see all of us, myself included, with this dependency on our i-devices or our smartphones. You’re right, there’s this contagiousness. Somebody quickly says, “Oh, I’m just going to check really quick. This may be the school,” or “Maybe it’s my boss.” That’s all good and well, but then you’re right, it loses the conversation. It comes to a screeching halt and then no one else knows what to do so they all check their phones too, right? Thomas: Yes. Exactly, yeah. I think you hit on a very important point talking about digital natives. You’re so right, your children will never know what it is like to not have a smartphone at school where you can reach them during the day, or if they’re out with their friends. You can reach them, or they can use their phone for entertainment. I think there are certain things that we say; “Gosh, the glory days weren’t so great.” We got lost when we didn’t know where we were going and we were meeting people and you’re standing waiting in the wrong place. There’s all sorts of things that happened before we were able to be continually, constantly connected. I don’t think anybody longs for those days necessarily but along with that convenience comes a whole lot of disconnectedness. I think that’s what you and I, both, are really aiming to just re-awaken in people. My greatest concern, frankly Kristin, is this is the tip of the iceberg. If we think it’s bad now, if we think that people are distracted now, give it five years when you’re walking down the street and people have virtual reality headsets on. Give it 10 years when you are reading your stock quotes and looking at your Twitter feed through a contact lens that’s embedded on your eye. It’s tough enough to pretend you’re paying attention when you’ve got to look down at a piece of glass that you’re holding in your lap that’s casting a blue glow. It’s going to be all news all the time whether you like it or not, and I think now is the time to really reclaim our humanity before we forget what that even is. Kristin: Absolutely. That’s why I’m so glad you’re here because your mission is just so aligned with who the Front Yard People are and what we’re doing through the Front Yard People Movement at the table. It’s almost like it’s so simple but it’s we have to start at the very beginning. With manners, I mean manners. In civility and just being kind in these early on interactions with one another. I feel like sometimes we’re in a stage where maybe we need to retrain ourselves what it’s like to actually sit down, look eye to eye and be kind. Now, some people listening maybe going, “Oh my gosh, really? Because I don’t have this issue.” I think it’s interesting. Kristin: Obviously, you’ve made an incredible career out of coaching people, major universities and companies on how to be civil and how to have manners in the workplace and in neighborhoods and in general life. Before we get into that though, I want to know where did the journey towards you being Mister Manners, where did it begin? What’s the very beginning, the genesis of that? Thomas: Well, I would say the genesis, truly, was from my own childhood. I was very fortunate to have many wonderful teachers, both actual school teachers but also family members who were teachers. For me, in particular, 16 years of going to Catholic school and having nuns who did not tolerate very much, I certainly couldn’t have had a cellphone in school. Cellphones weren’t around yet but if they were, they certainly would not have tolerated that. That’s where it began, and then I landed at Town & Country Magazine where I was one of the senior editors on staff. Among the responsibilities I had at the magazine was a column called Social Graces. It was really just at the early days of this, it was early days of smartphones and I remember I actually did an essay for the column. The column talked about everything from elevator etiquette to how to recover from asking a woman who’s not pregnant if she is pregnant. At the time, using that example, using that very illustrative example, it seemed a little silly to me to think that somebody would be at the beach and talking on their phone because we are still using flip phones at that time. Yet, here we are, not only are you talking on the phone but you’re probably doing selfies of your feet with the ocean in the background and posting it on Instagram and trying to make everybody you know jealous. I think for a lot of the media outlets, I was a little bit refreshing for them in the sense that I was, at the time, a younger man talking about something that may be people often perceive as something that women will talk about, especially in a professional way but not so much men. I think I filled the niche that was an important one. I left the magazine now about 10 years ago and have dedicated myself wholeheartedly to spreading this message. I had a column in The New York Post on etiquette, I did a show on Martha Stewart Radio Network on Sirius XM for a year also speaking about etiquette and manners. Now, I just consider myself so fortunate to be able to have the broadcast platforms that I do and then also the small groups that you mentioned earlier, that I have the chance to speak to. When I’m in the media, when I’m out there, when I’m talking on the Today Show or Dr. Oz or The Food Network, I’m speaking about some of these issues. It’s not me just one day thinking, “Oh, what pops into my head today?” It’s truly what I am hearing as you are, through The Turquoise Table. What am I hearing during my workshops? What’s really irking people? What are the pain points? What do we think should change? It’s through those interactions with truly thousands of people throughout the year in my courses, that I’m able to shape and form issues that are coming to the fore as the most important, when it comes to etiquette. Kristin: Wow. Well, will you share with us? What do you think, right now, is front and center on people’s minds and on their hearts? What are you hearing? Thomas: Well, I think one of the things and it’s because it’s in the headlines. It really does come into the realm of etiquette is the Me Too Movement. I go to speak in a lot of workplaces where there is just, frankly, there’s a lot of confusion. I think men who truly want to do just the right thing, don’t really know what’s appropriate at all. Questions like, “Am I allowed to ever compliment a woman on anything? Is that wrong?” I get from women, “I don’t think that we need to go so far that a man can ever say a nice thing to me.” Then others who feel completely different, who feel a workplace is a workplace, and it’s not the time for any of that kind of conversation, as innocuous as it may seemed to some. I think it’s an area that people really are struggling with. I think, frankly, it’s an important awakening that’s happening in the country right now. As with all movements, I think we’re still sorting our way through it. I don’t know that we found the magic formula, nor do I really think there’s quite a magic formula for every person or every workplace except that we really guide ourselves by that golden rule which you mentioned earlier, that you truly are treating people with consideration and respect. I think if those are your starting points, I think you’re off to the races and from there, I think a good social filter, common sense and knowing your corporate culture are all things to keep in mind. We’re still sorting through it and I think it’s going to be many more years before we really have a playbook on how it is but I think it’s important that we’re having a conversation. Kristin: Well, you nailed it there. Certainly when we’re at the table, I believe, and I’m passionate about this, this is where the conversations need to be happening. For example, with the MeToo Movement or with any of the headlines, and certainly the political season that we’ve all just come through–any of these things–to me the best place to have this conversations is face-to-face, across the table and starting small. I guess the discouragement too, of some of the confusion that you mentioned, is that when these things are played out on social media, we lose context. We lose the context of what we’re really talking about because they can go in so many different directions. I feel like that, sometimes, people don’t even know what they’re chatting or tweeting or arguing about anymore. Then it becomes a whole another issue. To me, I love that you are stewarding and encouraging and fostering dialogue in such a civil and a basic level because I feel like we’re not going to achieve solutions or resolutions or even a move forward if we can’t even have a basic conversation, right? Thomas: That is so true. Kristin: I love that and that was part of what we’re finding just at our table. These are the places and community to work out tough, hard, exciting, fun, all of the issues together when we can be sensitive to one another’s needs, when we can hear what the other person is talking about. I love that you’ve made an entire mission and an entire career out of that. It’s remarkable, it’s remarkable Thomas. I’m so grateful, grateful for you on that. Kristin: If we can … Go ahead. Kristin: Right. No, but that would be generous. I mean yes, we want to work you out of a job. That would be awesome because then you can write the book on how it all worked but I agree. Oh my goodness, that would be ideal. In the meantime, I would love to share with our listeners. When you and I had the conversation that we taped for the Today Show, and I’ll have all this for those of you listening in our show notes, but you gave incredible tips. You gave three really good pieces of wisdom for bringing communities together. You talked about being an ambassador, being visible and just gathering. Tell me in the context of bringing communities together, both at The Turquoise Table but really what you’ve seen all across America, what do you mean by those three tips? Thomas: Sure. Well, I think, and just to give the listeners some context, you and I could probably not be farther apart, both geographically but also in terms of the type of neighborhood that we live in. Of course, you’re in suburban Austin, I am in Upper West Side of New York City and yet, I find that neighbor issues really transcend zip codes. I hear very similar stories from neighbor to neighbor. In fact, my column for The New York Post, it was about neighbor etiquette and it was a question and answer column. I would get people writing in with everything from complaints about the person who parks in their driveway to the person who plays loud music at night and the person who doesn’t clean up after their dog on the street, you name it. The problems, really, I think all stem from the same issue which is what you’re tackling with Turquoise Table is that we’re not communicating. Often, when you got an issue with a neighbor, it’s probably because you don’t know that person. You’ve never even had a conversation, maybe you know them and you grunt as you pass them on the street or you give a cursory wave as you pull out of your driveways and that’s about the extent of it. What typically happens is when you encounter something that’s bothersome about a neighbor, rather than directly speaking with the neighbor about it in a non-threatening, a kind way, and I always recommend put the burden back on yourself, “I’m so sorry, you probably weren’t even aware, and I’m silly not to have brought this up before, there’s happening that I think you should be aware of. I’m sure if you knew about it, you’d want to change the situation,” is how I would always approach when you’ve got a complaint about a neighbor. Whether it’s they’ve got the rusted out hulk of a car on their front lawn, or they’ve transcended the property line with a tree, or they’re not raking their leaves—you name it–I’ve heard and see it all. It really starts with if we can consider our neighbors to be friends, we’re building communities, we start building bonds, we have less frustration. Frankly, the research shows, and I think a big part of the reason that we’re seeing so many issues these days, more than ever so before, is we’re such a transient population. People move. People move far more than they ever did. You get a job transfer, you go because you want to be closer for someone’s college, to get them at a community college discount. People are really moving around a lot which means that those permanent bonds are not what they were, perhaps, in the ’50s or ’60s. I think the three tips that we discussed during the Today Show program were number one, it really takes somebody to take the initiative. That was the ambassador portion of it. Truly, you’ve taken that level, that responsibility and you’ve done it to the Nth degree. The idea that what we could all say that we’re too busy and I just don’t have time but if somebody doesn’t step up to the plate and organize it, it’s not going to happen. I’d say to your listeners, if you’ve got a neighborhood and you feel as you did, Kristin, that you really don’t know your neighbors and how unfortunate that is, do something about it. I think your book is a wonderful resource and The Turquoise Table program is a wonderful resource for anybody who’s curious about how to do that. I think that’s number one, where it starts. Once those bonds start happening and once that outreach starts happening, you’ve created a community. You’re not just a group of ghosts passing one another as if you don’t exist, you’re actually friends, you’re colleagues, you’re all in a scenario together. You have a vested interest in keeping the community safe, and beautiful, and clean, and happy, and friendly, and welcoming, which so many of our communities are falling down in that regard, because people are not taking the initiative to meet one another and make that kind of outreach. We’ve lost that in many ways, and so I love your advice and your tips; that you’re encouraging people to do that because it’s not hard. It’s not rocket science. It’s just a matter of showing up and just being kind and civil. It’s so, so, so vital and so important. I hear it too, I know you’re all over America and you hear the results and the transformations. I do too. It’s amazing when I’m in communities across the nation of people who have taken the chance or not the chance, taken the time to be very deliberate. It starts small, get to know someone’s name and just be kind and say hello to them. You’re right, if your approach of I don’t want to assume anything but I just want to make you aware because then, I think you would understand. It’s just not commonplace anymore. I’m guilty of it. If I see dog poop or something that’s off in the neighborhood, I get a little grumbly before I even start to consider why, what happened, what’s the story. Put ourselves in that person’s shoes. There’s probably a reason or an explanation and if not, there’s probably a way we can help. Maybe somebody needs help in a situation. Thomas: Yeah, I think that’s an excellent point there. I think not curbing your dog, that’s a little bit more problematic because it’s hard to excuse that on any level. If they’re making a conscious decision to either say, “I’m too busy to do this. It’s too germy for me, and I don’t care,” so that’s perhaps a harder nut to crack. Although I think with most neighbor situations, it really is. It’s not that the person’s making a conscious effort to do something rude or deliberately inconsiderate, it’s just they genuinely don’t know. They didn’t realize the noise traveled as far as it did. They didn’t realize the leaves were blowing over into the neighbor’s yard who just raked their own yard. I’d say ignorance is 90% of the law in this case, and I think as long as we do it in a way that’s not sanctimonious, that’s not preachy, we don’t suddenly passive-aggressive and say, “Well, if they do that, I’m going to do this back.” Now suddenly, you’ve got the Hatfields and the McCoys, you started a war. You do not want that so don’t go down that path. If it’s somebody who’s just legitimately inconsiderate and just does not care, that’s a tougher one. All the conversations in the world, perhaps, are not going to change that person and then you need to take other actions but I don’t think most neighbor situations really rise to that level. It’s just that we don’t give ourselves the opportunity to have those civilized conversations. Look, think about the last time you had a problem with an online merchant or even in a store where something was not to your satisfaction. They went, not just to satisfy the issue, but they want above and beyond, so much so that you decide you were just a lifetime customer with that vendor. I think we have the same opportunity with our neighbors. You can overcome a problem, if you can overcome something that’s making your blood boil and turn it into a civilized, friendly conversation and correct a problem, you’ve made friends for life. How wonderful that you turn a negative into a positive. Kristin: I love that. That is a great example and so true. Well, I want to turn the tables just a little bit and so, let’s talk about, and if I can, let’s do a little role playing. Let’s assume that maybe there’s no negativity or no ill feelings but there’s also no positive things yet. Let’s say you’ve just moved to a neighborhood and perhaps you don’t know anybody. Maybe you’re walking down the street or you’re in an elevator going up, what are some easy initial ways to engage a neighbor. That’s friendly and genuine but not weird or awkward or stalky. I know this sounds so basic but I think we have to have these conversations. Thomas: You’re right and what’s funny here is I would say very similar things to the things that we talk about when we’re at a cocktail party and meeting strangers or a networking event and meeting strangers, are some of the very same conversation starters that can work for these situations. To take it back to the start of our conversation, if you want to meet people, do not be waiting for the elevator staring at your phone. If you really want to meet people and look, I’m a runner, I love fun, inspiring music when I’m running and there’s nothing wrong with that; but if I were moving to a new community and everywhere I went I didn’t walk out my door without my headphones in and my phone glued to my eyes, I’m not sending a message that I want to be someone who’s met. I think that’s for starters, that’s an easy one for all of us to do. Kristin: Hey, everyone. Just a quick little break to tell you about the amazing sponsor of our show. If you were not already familiar with Shipt, that’s S-H-I-P-T, I’m about to change your world. Shipt is an amazing grocery delivery service that brings groceries from your favorite local grocery store straight to your front door. I have been using Shipt since they came to Austin, and as a busy mom with a big family, trying to balance schedules and dinner, it is a life-changer. It’s so easy. You download their app, you order your favorite products, and then they’re delivered right to your front door. So here’s the good news; as an exclusive to listeners of our podcasts, we’re offering an amazing deal to try Shipt today. For only $49, which is a big discount off their regular $99 price, you can get a full year of Shipt services. And get this – Shipt is expanding their delivery in many areas to include Costco and Target. So here’s what you do to get your Shipt membership today, simply go to shipt.com/kristin. That’s S-H-I-P-T.com/kristin, K-R-I-S-T-I-N, for your $40 membership to Shipt for an entire year. What a deal. All right, let’s go back to our show. Thomas: The second thing, I think, is focus on the easy things to start conversations about. Two things that people love talking about are their pets and their kids. If you’re in an elevator and somebody’s got a beautiful dog or somebody’s got a beautiful child in a stroller or they’re out walking the dog or out walking the child in a carriage, that is just an immediate entrée to talk about, again, to people’s two favorite subjects. Even if you’re not a dog owner, you certainly can bond with somebody over their dog and even if you don’t have children, you can bond with somebody over their kids. I think that’s an easy one. Now, okay, not everybody has a dog, not everybody has a child that they’re pushing in a stroller. There are still things that you can do. I think what you’ve done, by creating a gathering spot, I think that’s a wonderful thing. You’ve created a venue, you’ve created an oasis for people to be able to stop and talk and sip a little lemonade. I think that’s a wonderful thing. Kristin: Well, thank you. I think it’s interesting too, the dogs. We, right now, don’t have a dog in our house but early on, when I would sit out at the table, there’s a rhythm to every neighborhood. Every neighborhood has a rhythm. Our neighborhood in Austin, Texas, the rhythm isn’t going to look like you said, like the Upper West Side in New York but we have a lot of dog walkers. We live on a slight little hill, an angled hill, it’s easy walk and because of our weather, people can be out all the time. Early on, I noticed that three, four times a day, different dog walkers would walk by and so, I put out just a dog bowl for the dogs to have water. Sometimes, I think it’s easier, to your point, to say, “Oh my goodness, what’s your dog’s name?” or “He or she is so beautiful,” or “What kind of dog is that? Looks familiar.” It’s easier than just saying, “Oh my gosh, hi.” There’s that awkward pause of I mean, I really can’t compliment you on your looks, I can’t compliment you on where you’re from because I don’t know. You’re right, having a child or certainly a dog has worked, like you said, it transcends. It works in New York City and it works in Austin, Texas. I love that. Thomas: To your point, Kristin, about you can’t compliment someone on their looks and I agree with you on that especially somebody’s a perfect stranger. You don’t want to be misunderstood. I do think, and I recommend this, again, for people who are in any kind of an environment where they’re meeting strangers whether it’s a professional setting or a neighborhood one, there are certain aspects of a person’s appearance that I think are very fair game. They are the types of things that people clearly want to be noticed for. For example, accessories. If you’ve got some really fun, funky statement glasses that you wear, that you’re clearly not warning these because you want to fade into the woodwork. You’re wearing these huge, turquoise, polka-dotted glasses because they’re fun and you want people to notice them. That’s fair game. Maybe it’s a statement necklace that you’re wearing or a really cool watch that you’re wearing. Those, I think, are perfectly fine. Maybe it’s a necktie, I’m wearing, you can’t see it but in honor of our conversation, I’m actually wearing a turquoise necktie right now. Kristin: Thank you. I love that. I love that you still wear neckties, you know? Again, there’s the difference between Austin, Texas and New York City. Thomas: If I were in Austin, I would probably have to come up with some alternate solution. Kristin: Exactly. I love that. Thomas: Basic things like that I think are nice complications. And then the final thing I would just say is make an effort, and this is for any interactions you’d have with anybody you’re meeting in the first time. Make an effort to remember people’s names. People love the sound of their name, people love hearing their own name, and if you meet somebody and you might be terrible with names, and many of us, most of us, probably, are, I would write it down, I’d come up with some … after the fact, of course. I’d come up with some visual image that’s going to help you remember it the next time you see that person. I’ll tell you. If you meet someone once and you remember their name and you see them a week later and you use their name, they’re going to be so impressed. And I’ll tell you, they’re going to make an effort. They probably will not have remembered yours but they’re going to make an effort to remember it that time. I think that is where conversation and connection really starts, where we both know one another’s names. As you said, it seems so simple, it seems so elemental, but it’s the first essential building block of forming any kind of a friendship relationship. Kristin: I mean, could not agree with you more. And it is. It’s like, “Okay, that’s a no-brainer,” and yet, then I find myself struggling still. I’m like, “How do I do this? How do I, you know?” And some of the tips, like you said, I try to write it down quickly as soon as I can after the fact so that I don’t forget. It’s a discipline. It really is, but I think it’s one that, if we skip over knowing someone’s name, you’re right. We miss that incredible first step. It’s so important. Again, I think if all we did out of this was to encourage people just, A, to be friendly again, but just try to remember one person’s name this week. One person who is in your daily commute or in your neighborhood. You know, make a commitment to start learning those names. I think that is an incredible first step. Thomas: And it’s not as difficult as people often think it is. Again, the first thing to remember is most people struggle with this, as I said, so don’t feel like you’re the only one. And frankly, if you don’t remember somebody’s name, it’s okay. You can certainly ask. They’re not going to say, “I’m sorry. I said it once. You’re not getting another chance at my name.” So, don’t try to fake your way through it. But some tips I like to recommend people employ, and again, this works in a business setting or in a social setting is, first of all, come up with an adjective that starts with the same letter as the person’s first name. If I’m hearing, I’m meeting you for the first time and you tell me, “Hi, I’m Kristin.” So, Kristin, of course, could be spelled with a C, it could be spelled with a K. I don’t know that because I’m only hearing your name. I’m not seeing it on paper, but I might think to myself, “Here’s somebody who’s really caring, so this is Caring Kristin.” And I’ve now got that. What does that mean? It means that you just care about everybody you meet and you show that in all of your actions. Frankly, your last name is such an easy one too, if you want to come up with a visual shell as your last name, I’ve got this image now in my mind that you care so much that every new person who moves to the neighborhood, you bring them this beautiful shell that you give from your trip to the seashore. So, I’ve created something that is … it’s not reality, but it’s my own little visual memory game. The next time I meet you, I’ve got those to fall back on, rather than no visual whatsoever. And I’m going to remember your name that much better. Kristin: I think that is such a great tip. And plus, it’ll be fun. So if you all are listening, you’ll have to share with us these visual or these words and tips that you’re coming up with people’s names because I think that’s awesome. Well, what about someone who really … I hear, in my line of when I’m traveling and speaking with people, and I’m sure you do too. I’m an introvert. This is hard for me, and a lot of people assume, because I’m an extrovert, “You’ve got it easy. You can meet people and it’s easy for you.” What do you say to someone who really, it is hard and maybe their introverted tendencies are putting a barrier out there, whether real or perceived? What do you say to them? Thomas: Sure. Well, I think, for starters, I would urge them to reconsider their belief that everybody who seems like a natural extrovert is truly a natural extrovert because so many people you will meet who you think, “Oh, my goodness. This person is the life of the party.” For them, it’s actually quite an effort and they really have to psyche themselves up to be … or at least they weren’t naturally that way. So, there are very few born … we don’t come out of the womb as a natural extrovert, most of us. It’s something that we either learn or fight our way through, so don’t feel that you’re so handicapped that it’s simply not possible because it’s not in your own DNA. That being said, I think most people generally enjoy speaking about themselves. So, you don’t have to be a sterling conversationalist to be able to carry a conversation. You just need to be able to show some interest and be inquisitive. I think it’s partially because I’m a journalist, but I feel there is no such thing as a dull person. Only dull questions. And if I’m hitting a conversational wall with someone, maybe it’s because I’m asking close-ended questions. I’m asking questions that could be answered with a yes or no. So, I don’t ask close-ended questions. I ask open-ended questions. So, I might say something like, “Where have you been recently that you really enjoyed?” Or, “What movies have you really enjoyed lately?” rather than, “Have you seen any good movies lately?” No, not really. Okay, now, awkward pause and awkward silence and where do we go from here? So, I think, as long as you come with an open mind and you’re prepared to show genuine interest in that person, you can let them do most of the talking. It’s you just asking some fun, insightful questions. Kristin: I love that. I love the practice of not asking close-ended questions. You’re right. Because you get the yes, no, and then where do you go? So that’s such a great tip, and I think we all know that but then we forget in the moment, perhaps, and it’s just a little bit of practice. Just rephrasing these easy conversation starters. I love that. Okay, one more question because I obviously got neighbors on my heart. Are there any dos or don’ts about just knocking on a door and introducing yourself? I mean, that can be perceived as weird but let’s … you know my neighborhood because you’ve been here, and so pretend I don’t know any of my neighbors. I just moved in. I mean, what would you say to someone about just knocking on the door and not coming across as weird or just that first moment. What would you advise? Thomas: Yeah. A few things. I think, first of all, and this also hearkens back one of my tips that we had discussed earlier about being an ambassador. So, it’s nice if there really is someone in the community who takes the responsibility to be the welcome wagon, so to speak. To go over with a basket of muffins and welcome the person to the neighborhood. We all need an ally. It’s unsettling to move to a new home and a new place and feel like you left maybe a neighborhood that you loved behind but for whatever reason, you’re now in this foreign place and you feel like you’re the outlier. It’s so nice if that’s the case. If you really do have one or two people who take that responsibility. But that’s not always going to be the case. So, you said you moved to the city and you’re the newcomer, or you moved to a town and you’re the newcomer and you feel like, “All right, it’s been a couple of weeks, and no basket of muffins has been forthcoming.” I would start with as many interactions as you can outside, so that’s not threatening at all. So, spend some time out on your front yard, playing with your kids, playing with your dog, gardening, doing outdoor activities, taking walks in your neighborhood, taking a run in your neighborhood. You’re going to run into your neighbors eventually that way. You probably don’t want to try and strike up a conversation if somebody’s dashing off to work or gets to soccer practice. That’s going to seem like maybe they’re blowing you off when in fact they’re just rushing to get somewhere. But if you can catch people, I would say, especially on the weekends where those of us who are lucky enough to have at least a little bit of a respite, I think those are fine times. Kristin: Yeah. Here, here. Right? I think that’s a great way because, frankly, if you’re a host, you’re going to get to know people, and they’re going to get to know you. That’s probably going to be a little bit more productive than going on a vacuum cleaner salesman tour, where you’re going from house to … ringing doorbells. Kristin: I love that. I know. I mean, ringing the doorbells, okay, I think it’s a comedian. I remember seeing a YouTube video not too long ago about, and I can’t remember the name of the comedian. I’ll find it and put it in our link, but yeah. He was poking fun of what happened in the old days, or olden days. Heck, it was when I was growing up too. We were so excited to go, “Who’s here? Who’s here? Let’s go see who’s at the door.” And now it’s like everybody’s ducking and like, “The doorbell rang. Pretend we’re asleep. Turn out the lights.” It’s such a funny one. I’ll try to find the links to that. Kristin: It is, but I love how you are saying, “Just be an ambassador.” It’s almost like somebody has to go first. Don’t be scared. What I hear over and over again is that everyone really is longing for that connection and that community and it really does just take someone to go first, to be kind, to sort of have, you know, approach with decent manners. Again, it seems so simple but it works, and so why recreate the wheel, you know? Thomas: That’s right. You’re going to feel so good about it, and you’re going to get so many compliments. People are going to be saying, “I can’t believe it took the new person for this to happen. I’ve lived in this neighborhood 15 years and nobody’s ever done this. Thank you so much for taking the initiative. Now, look, does that mean you’re going to get 100% attendance? Does that mean everybody’s going to arrive with hair in place and smiles on their faces and neckties on? No, and that’s fine. I mean, you’re not running for office. You don’t need the entire neighborhood. There are people who just feel like, “I’m a private person and I have no desire to now my neighbors.” You know, give them that. I mean, that’s their prerogative to feel that way. But let’s just hope you don’t live in a neighborhood full of people who feel that way. Maybe then it’s time to, before you settle down too much, it’s time to move on to a different neighborhood, if that’s the one you’ve moved into. Kristin: Right. But I do believe that what happens in our … I mean, we cannot control sort of what I call that 30,000-foot decision level mechanisms. I can’t control what’s going on around the world or certainly at the decision level makers. They’re in Washington or on the news or whatever. But you know what? We can control what’s happening in our front yards or in our courtyards or in our parks or in these small little grassroots places where we gather. And I do believe it’s our responsibility, rather than just saying, “Oh, well, if only,” or, “Oh, if the world was this way,” or, “If laws were this way,” or, “If the media were …,” or whoever was this way, well, we can’t change that so let’s take it back. Manners matter. Let’s bring it back at a very grassroots level because I believe that then sort of table by table, block by block, city by city, we will have that change and we’ll be in a better position when that time comes that you were talking about at the very first, when we just hit the tip of the iceberg in communications styles and in challenges that we may have five, ten, who knows how many years since. Thomas: That’s right, and I think here’s again where technology being a neutral thing, use technology to its best abilities. Okay, yes. We’re all busy. We’re all running around. We’re all hyper scheduled. Maybe you create some kind of an online community board where you’re able to put information about the new trash pickup that maybe people don’t necessarily know about, or maybe you have a sofa that’s lightly used and you want to … I think these are wonderful ways to connect with the neighbors, but it has to start first with that grassroots effort that you’re talking about where we’ve got … We know who Kristin Schell is. We know a face, we know a family, we’ve socialized, we’ve broken bread together. Once that’s done, allow the technology to cement those connections and make the communications easier so that you really can have that wonderful face to face interaction. It’s not about just disregarding the technology entirely. Use it to the fullest extent you can without losing the face to face. Kristin: Yep. So good, so good. Okay, one final question. I think I’ve already said that twice but this is it. Really, for real. When you go to visit someone, or you are going to a party or on a social call, what are one or two of your favorite little hostess gifts or things to take when you’re meeting someone new? Thomas: Well, thank you for that. I always like to say you do not arrive in someone’s home empty-handed. And I think you want to know your audience a bit if you can. The more personal you can make the gift, obviously, the better. But presuming that you know absolutely nothing about the individual, I would say there are a few tried and true that you really can’t go wrong with, and I would say my number one favorite is to bring a box of beautifully-packaged chocolates. They’re so decadent and they send such a warm and wonderful fuzzy message. Could you go wrong? Could you find somebody who absolutely hates chocolate or somebody’s allergic to chocolate? Well, for sure. In that case, it’s their prerogative then to just give it away to someone else who they know might appreciate it, but I think the point is you’re putting in the effort and you’re not just grabbing the first thing that you encounter on your way to the party. Kristin: Well, no, you did. You brought me chocolates. You brought me delicious chocolates and I remember, after you left and we were all exhausted from a full day … You know, Mom. You remember, you met my mother and sweet Dana, and we sat down at my kitchen table and we giggled like school girls, and I ate every single bit of that chocolate. So, that is always a winner. I mean, I think you’re absolutely right that chocolates’ the way to everybody’s heart, I would think. Well, Thomas, thank you so much. I mean, I’m honored that you would be on the show. I’m grateful for your message. Please keep spreading it wherever you go and it’s so important. Where can people tap in and find you? I’ll put all of this in the show notes, but where’s the easiest place for my listeners to learn more about you and find out more about … What you do in your career and how maybe, if they work for a company or an organization that might need Mister Manners to come teach them, where can they find out about you? Thomas: Thank you. That’s so gracious of you to ask, and I just want to say thank you for the opportunity to speak with you and your audience because I firmly believe in what you’re doing. I think it’s wonderful. If I’m handling corporate America and a lot of census is in what I do and my day to day, I think you’re handling the neighborhoods. I think we’ve got a whole lot covered there. We’re off to a wonderful running start. Anyone who’s interested in what I do or finding out a little bit more, my website is whatmannersmost.com, and I am known as Mister Manners. I don’t know if we mentioned that but I’m known as Mister Manners, so you can find me on Facebook there. My Twitter, and that’s mister, as opposed to just Mr. Twitter and Instagram, same thing. Mister Manners. I’m launching something new, Kristin. I haven’t yet tried it, but I have just put up on Instagram that I’m going to start taking etiquette questions via Instagram and answering them with video, with a little video reply. So, if any of your listeners have a pressing etiquette question or a neighbor issue or something that’s just … they’re looking to settle a score with a family member about something that’s a matter of dispute between the two of them, if they want to follow me and send their question on Instagram, I will happily post a little video and help calm the waters for all sides. Kristin: Wow. I love that. I’m so glad you shared that. That’s brilliant, actually. Talk about a good use of technology. Because then they get access to Mister Manners right there, solving problems. So, I love that. We will make sure to put all of your handles and how they can access and ask you. Ask Mister Manners. I love that. Kristin: Well, it’s just been a delight and thank you. Cannot thank you enough. If I had flowers and chocolate and good things right here, I would hand them right off to you but I appreciate you very, very much and I’m grateful you were with us today. Thomas: Thank you. Thank you for the opportunity. Kristin: Welcome to my kitchen. This is the part of the show where I actually go into my kitchen and share recipes. A yummy something delicious to either take it to a neighbor, to serve your family, or out at the Turquoise Table. I was so encouraged by our conversation with Mister Manners, and I love that Thomas brought up two of my favorite things as hostess gifts: chocolate and flowers. So, I’m actually making one of my grandmother’s tried and true chocolate sheet cake recipes today. And I’m going to kind of walk us through and I’m going to talk and cook, but this recipe is really simple and I’m making it because I have a group of neighbors coming over tomorrow. Now, for those of you who are just joining us, you may be thinking, “Well, great. That’s good for her that she has a whole bunch of neighbors coming over,” but I want to take us back in time because, five years ago, I would not have been standing at my kitchen counter making chocolate cake for neighbors, because I really didn’t know my neighbors, and I certainly didn’t know them well enough to be having them over for coffee and discussion and to slow down long enough to enjoy chocolate cake. So, I want to back up and have us start at the very beginning of this story, and since it’s our very first episode, I think that Mister Manners did a great job of sort of setting the scene for us. We’re talking about why civility matters. Why just being kind to people matters, and so before I invite you to dive in and start making recipes or knocking on doors and getting to know your neighbors, I just want us to just go slow in this. The goal of this podcast is to really come alongside you and to encourage you and to share, not only my stories of what’s worked in the five years that I’ve been living as front yard people, but to share stories of other people and to have guests who are way smarter than I am, like Mister Manners and others to come, kind of share their tidbits too. Maybe you were just new to hearing about the Turquoise Table. Maybe this is a concept that you literally stumbled upon like today or as you’re listening. First of all, welcome and I hope that, as you come to the table often and frequently and that you know that you’re welcome here, and that you will be encouraged to join us in this endeavor to really build community by getting to know our neighbors. Maybe you have had a Turquoise Table for a really long time. Maybe you are just excited about spring. I don’t know what the weather’s like where you live right now, but in Austin, Texas, I mean, it’s almost full-on spring. I see hints and glimmers of sunshine and certainly daylight savings time now makes the sun out longer, and so I’m getting excited. It is almost time to be outdoors a whole lot more, and I see it our community. In fact, I saw a post just today from Dianna in Tulsa, Oklahoma. She posted a photo this week at her table and her kids out front playing checkers at the turquoise table in their front yard and here’s what she wrote. Springing, so springing into action at the turquoise table. It feels like we’re coming out of neighborhood hibernation. So, whether you are, like I said, new to this journey of living as front yard people or you’re just getting your table ready for spring, I’m glad, so glad, that you’re here. And we’re all in this together, so no matter where you’re starting, we’re in it. So, just like there is a rhythm to the year and the change in the seasons, I want to talk a minute about the rhythm in your neighborhood. Here’s what I want you to take away today. If you want to make the cake, awesome. I hope that you will, and I hope that you will share it with your family or your neighbor or find someone to just sit down and slow down and enjoy chocolate cake with. I hope that maybe you’re inspired to pick up flowers for someone. Do you know my favorite flowers are actually grocery store flowers? I know, right? I think that grocery store flowers are literally the best thing going. They are affordable, they are fresh, they’re pretty, and they also allow me to kind of cut them up and put them in maybe a mason jar or an old … I love putting them in cans. Just like the tomato cans. Anyway, you’ll find something around, but I love grocery store flowers. It’s just one of my things. But before we dive into grocery store flowers and taking cake to neighbors, like I said, I want us to focus today, right now, on the rhythm of your neighborhood. So here’s what I want you to do until next time: I want you to think about the place that you call home. So, as you’re listening right now, maybe close your eyes. Well, unless you’re driving. If you’re driving, do not close your eyes. But if you’re just listening, whatever you’re doing, take a minute and just visualize. What’s the place look like, what’s the rhythm like in the place that you call home? Do you live in an apartment, or perhaps maybe you’re like Mister Manners and you live in a very urban setting. Maybe you’re in a rural area, or suburban America. It doesn’t matter. Just I want you to really think about the place that you call home, and what is that rhythm? Is it very busy? Do you know your neighbors? Do you have frequent interaction already with your neighbors? I want you to just take some time and just think about the rhythm and the place that you call home. Because, as we move into this adventure together, and as you hear from all these incredible guests that are coming up, only you know what is the pulse and the heartbeat and the needs of your community. Like I always say, what works in Minnesota may not work in Austin, Texas, and certainly what works on the upper east side of Manhattan may not work in Southern California. So, take some time before you dive head first into this. Take some time and just notice. Just slow down and notice. I write about this in the book. There’s actually a quiz you can take and some guided exercises, just to kind of help you understand the place that you call home. If you need to slow down like me. My life is so crazy and so busy, maybe you should bake the chocolate cake, maybe it’ll slow you down long enough, and while you’re sifting and baking and thinking about, you know, the place that you call home, something will come to you. I want you to come back. I want you to come back and listen because we have incredible people, just Thomas, lined up for you. And it’s amazing, and I know that you will find something in each episode that is going to encourage you and inspire you to take the chance, take the dare. Take three steps out your front door and begin living as front yard people. So, until next time, let me know what you’re thinking. If you have the opportunity to check out the show notes, and maybe you’re going over there to get the chocolate cake recipe, send me an email. Let me know what your neighborhood’s like. What are your dreams for your neighborhood? What would you change, if you wanted to change something? Do you know people there? Send me an email. I’m all ears because we’re in this together. Until next time, I’ll be back. I’ll be back soon, actually, with more recipes and more tips and we’re going to get to know each other pretty well, gathered around the table. So, until next time, gather small and love deep, friends. Show Closer: That’s it for today’s show. Thanks for listening. Be sure to subscribe to the Turquoise Table with Kristin Schell and give it a thumbs up if you enjoy it. Until next time, gather small and love deep.